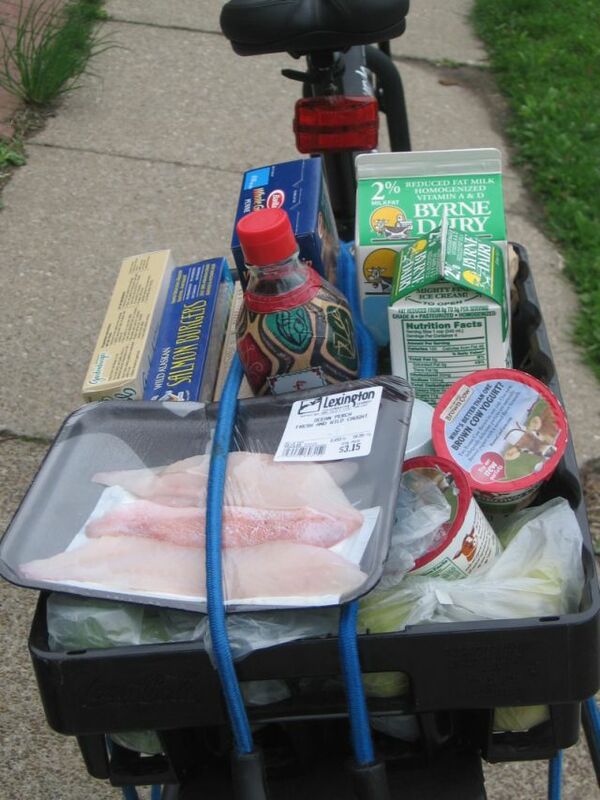 $58.27 in groceries in a plastic crate. So there I was as usual...pedaling and coasting down Elmwood Avenue on my way home from the local food co-op. The day was sort of odd...it seemed autumn-like. Anyhow, I was almost to the intersection of Elmwood and North Streets when I hit a small bump in the road (literally and metaphorically). The light was just changing, so like a person in a car not wanting to miss it I stood on the pedals and and pushed through. As I was flying through the intersection I heard something that sounded like a "pop." As I turned I saw it was a yogurt container that fell out of the crate. I pulled hard on my breaks and screeched to a halt as the container of yogurt (which surprisingly didn't break) spiraled through the intersection. What surprised me, and what I find truly interesting, is that cars also came to a halt. Drivers stopped to avoid hitting the yogurt, allowing me to retrieve it. I felt a little embarrassed and flashed them the peace sign as I grabbed the container from the intersection. I wished I had my camera with me...I had never saw yogurt stop traffic.